A series of unfortunate injuries to leading trail runners this year means that new champions will be crowned at the 22nd running of the 2018 K-Way SkyRun taking place in Lady Grey on Saturday 17 November. K-Way athlete and defending champion Lucky Miya, who will not be able to fight for his crown in the 100km race, due to injuries during the year, will be welcoming in the 2018 champion before heading out on the inaugural 38km night run at this year’s event. “We are sad not to have our defending champs back to try reclaim their crowns, but it means that we have an exciting race on our hands for who will take the title this year,” says race organiser Mike de Haast from Pure Adventures. Leading contenders in the men’s race this year include K-Way athlete AJ Calitz, who has yet to add a SkyRun win to his list of achievements, along with Stewart Chaperon, who was crowned South African Ultra Trail Running Champion after his recent win at the Addo Elephant Trail. Also in the mix are SkyRun stalwarts, Hylton Dunn and Mr. SkyRun himself, Bruce Arnett, who has taken the title 13 times. The bug has bitten Nepalese mountain runner, Sange Sherpa, who will be back for his second year to race SkyRun after coming 2nd to Lucky Miya in 2017. There is a joke amongst mountain and trail runners that SkyRun has been bewitched by a foreigner curse, in the last 21 years of running this race, despite some of the very top names coming out to do it, it has never been won by a male foreigner, with overall first place always going to a local South African runner. Can Sange break the curse this year? And will this be the year that the elite men are able to break the Sub12 time barrier? Ryan Sandes was the first to run a sub14 in 2012, and this time has since only been achieved by a select few number of athletes, with none having yet gone under the 12 hour mark! In the ladies field, SPOT athlete Naomi Brand, who has been making a solid name for herself on the trail running scene is a firm favourite for first place, with SkyRun regulars Su Don-Wauchope and Tracy Zunkel hot on her heals. In 2016 former SkyRun champion and K-Way athlete, Nicolette Griffioen, set a record sub 16 hour time of 15hrs16min. “No woman in the history of the race has been able to break the sub 14 hour time achieved by male competitors,” says Mike, “but we know how strong these ladies are and we know that endurance and toughness are where they excel, so we are hoping for great things this year!” Unfortunately Nicolette has been amongst the list of injured athletes this year and will be running the 100km route with her mom as part of her fitness rehabilitation. K-Way athlete Cleo Albertus, will be looking for first place on the 38km route after her recent win at the 3 Peaks Challenge. 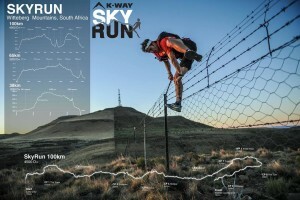 K-Way SkyRun will be taking place on the 17th of November 2018 in the small town of Lady Grey In the Eastern Cape. The race encompasses 3 distances – 100km, 65km and a new 38km route. All 3 races are unique in that they are truly self-supported and self-navigational races, where athletes tackle the remote terrain of the Witteberg Mountain range with a map, compass or GPS unit and a backpack containing all their food, water and compulsory equipment that will enable them to survive in this harsh environment, while operating at an average height of between 2200-2500 meters above sea level. Live tracking for the race will be offered through Sportraxs and all social media channels will be kept updated throughout the race to let supporters know how their competitors are doing.